Bench Business: Bench Magazine Is Going GREEN! Bench Magazine Is Going GREEN! Bench Magazine has always been printed on Recycled Paper. However, even recycled paper consumes enormous amounts of electricity and water in its production. Plus it uses up valuable landfills just like ordinary paper. In addition, large amounts of diesel and gasoline fuels are wasted shipping the magazine across the country and around the world. Let’s face it. Printing a Paper Magazine is Expensive and Wasteful! In order to Conserve the Environment and help Save the Planet Bench Magazine is Going Green! Beginning with the Winter 2009 issue we will no longer print a paper edition of the magazine. From now on Bench Magazine will only be available from www.BenchMagazine.com as an easy to use digital file. Each issue will be available in PDF file format. There will be both a High Resolution Version, which is suitable to read on High Definition computer screens and to print out any articles you wish, and a Low Resolution Version for faster downloads suitable to read on screen and to use on many portable readers. You can go to www.BenchMagazine.com today and sign-up to receive e-mail notices for each new issue. 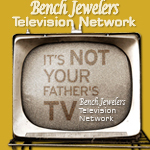 Bench Magazine is free of charge to all bench jewelers worldwide thanks to the generous support of the advertisers. Back Issues of the Printed version of Bench Magazine from the past 7 1/2 years! Complete Set ALL 30 Issues!